What a grand time we had in studio! If you remember from a previous Shared Desk, we enjoyed good panel with Stacia Kelly & Nick Kelly, another husband and wife team in the Science Fiction and Fantasy market. We finally got them over at Imagine That! Studios, enjoyed the last of the gas in the grill, and got them on mic. In this first in-studio appearance (and something tells me, far from the last) we talk about the recent Endless Possibilities Book Tour, lessons learned, and where we are going from here. We’ve got alcohol introduced into the system which means the drops-in’s are leaning towards the ruder side of things. Even with guests in-studio. Welcome for the first time in-studio our special guests, Nick and Stacia Kelly. Good things about Trinity Episcopal: We meet awesome people! What do you do when you’re about to have a book released? Tee — Goes on a CLEANING BINGE! Stacia — When she is nervous, she dances! Then cleans up after herself…. A lot is riding on this new book. There’s been a lot of hype around the book. No one touches the bell! How do you organize one? WbtR wanted to try something new with book promotions! Nick admits there was a learning curve, but there were some challenges ahead. Is there a strategy at composing blogposts? What are tips for participants new to blog touring? Tee — Ask your blog host “What would you like?” and pitch ideas. Timing on topics does matter. Search Engine Optimization (SEO) — does it really work? So someone is intimated by Tee? For what exactly?! Oh MySpace’s Tom, where are you now? If you are going to blog about something out there or controversial, own it. Pip reads the web, and Nick is happy. A threat that that is creeping up on established authors of the Empire: The Loss of their Cushy Offices in London! Nick and Stacia take the blame for what happening to toad’s professional author. Stacia shares an opinion on those who rely solely on traditional house publishing. What you, as an author, need to do to survive in today’s modern publishing world. Do authors really need a downtown metropolitan office?! Nick Kelly steps up and knocks it out of the park! Remember: Always honor Rule #34! Holy cow! Two in two weeks?! The deuce, you say! We do say! 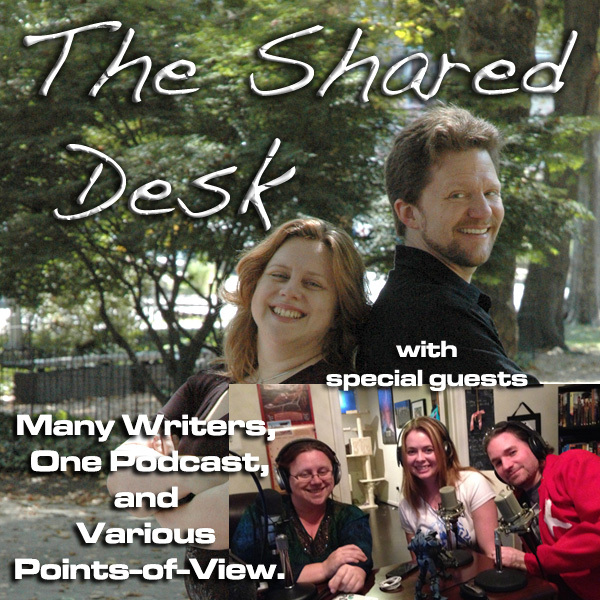 And it’s a special Shared Desk as we’ve recorded our panel at the Write by the Rails meeting that included a panel discussion with couples that collaborated on their writings. Joined by local authors Nick and Stacia Kelly, Tee and Pip share stories and approaches on how they make a collaboration work and also share advice on how to keep collaborations successful. Quick Announcement — Tee & Pip will be working the York County Library on JULY 30!!! Who’s on the panel tonight? What’s the collaboration process between us? Stacia got an idea, but wanted to write with her husband, Nick. 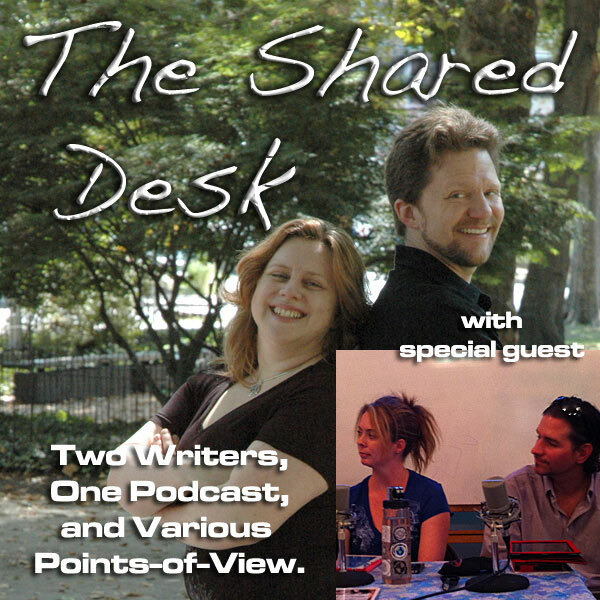 Nic and Stacia discover their differences in how they write. The truth of successful collaboration, and how marrying your writing partner is not the sure-fire solution to a great process. Pip and Tee talk a bit about Discovery Writing. When you do the open idea sessions, all four of us need to write it down! Pip & Tee flinch over the “Red Pen” experience with Harper Voyager. How does collaboration go with people outside the writing experience? Okay, Tee could get behind the “Hot Tub” sessions…. Stacia stands alone as the writer amongst the experts. Let the madness commence! Tee finally reveals the story behind his first story…and it is as epic as the story itself…. Pip’s “bad experience” was actually not that bad. Facing the worst-case scenario as a married couple. The panel goes deep into having an Exit Plan and the importance of communication. Spending some quality time on Jack Mangan and his influence on The Ministry of Peculiar Occurrences…. How do you divide responsibilities between yourselves? Pip and Tee evolve their collaborative process from when they went from a podcast-for-pay to a series from Harper Voyager and Ace. Stacia makes Nick put on a “special suit” for working out fight scenes. Nick breaks down their writing process using a musical analogy. How did Pip and Tee first meet? Do you all do your own editing? Why hiring an editor is so important. But you should still edit your own drafts before going to an editor. When is the editing done? How many Beta Readers do you have? What are you doing when you’re not writing? It’s a wide field of expertise. ….and that’s all from us here at Write By the Rails! Find us on Twitter at either Tee’s or Pip’s account, leave us a voicemail or question for the show at 703.791.1701, or leave us a comment here at the blog.